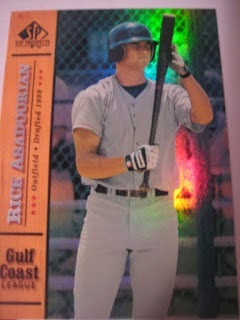 Rick Asadoorian was drafted as an outfielder in the first round of the 1999 draft by Boston. After seven years in the Red Sox, Cardinals, Rangers and Reds organizations he switched to pitching, last appearing for the Can-Am League Worcester Tornadoes in 2010. Now the Men's Baseball Recruiting Director at SportsForce, he kindly answered my questions about baseball cards. "I do not really collect cards myself. Although I do have at least one of each that has been given to me over the years. I had fans who were very generous and gave me a few cards at times when I signed for them. I signed as many cards as possible for fans and continue to do so when asked. My favorite card of mine is the card where I am jumping up the wall to catch a ball. While that wasn't in a game it was in fact a real catch. The ball was thrown from about 100 feet away and i went up and caught it. It was very fun. The best story I have for you is from when I was in Augusta playing for the Greenjackets in the South Atlantic league in the Red Sox System. There was a fan at the game early and had about 40 cards of mine in a well kept book. Since he was the only one there I signed about half of his cards. I only signed half because of what he said to me. While signing the cards, he asked if I would like to have any of the cards. That was common for fans to offer a card or 2 for me taking the time to sign for them so I said "sure, that would be great. My dad will love them." after I said that he said he would trade some cards for a pair of Batting Gloves. Here I am signing a bunch of cards for this random guy and he asks me that. After that I said I was done signing for him and said seriously?. That still bothers me to this day. I always take care of those who take care of me." I have 61 cards of Mike Boddicker. This one is from 1986 Sportflics. Playing career: Mike Boddicker pitched fourteen seasons in the major leagues. His first two seasons were dominant – 16-8, 2.77 as a rookie for the 1983 World Champion Orioles (and two complete game victories in the postseason in which he did not allow an earned run); followed by leading the AL in wins (20) and ERA (2.79) in in 1984. However, in that 1984 season he struck out only 128 batters in 261.1 innings. Pitchers with that kind of ratio are usually unable to maintain a high level of performance, and Boddicker was no exception. However, he was able achieve double-figures in wins through the 1991 season, maintaining a respectable ERA most years. For his career he finished 134-116 with a 3.80 ERA. Those numbers are inflated by those first two seasons, though. From 1985, when the league started figuring him out, through his 1993 retirement he was 97-96 with a 4.09 ERA. Where he is now: He does some youth coaching near his home in Iowa. My memories: I rememer being on a family vacation in Massachusetts in 1988 and reading a local newspaper. It was a treat in those pre-internet days to read a newspaper from a different state. The big news in the paper was the Red Sox acquiring Boddicker in a trade with the Orioles. Google Autocomplete results: He is second when you type Mike Bod, between Mike Bodge, a web designer, and Mike Bodson, CEO of the DTCC. Another prominent Mike Boddicker is a film composer who did the soundtracks for several famous movies. The two Mike Boddickers are distant cousins. Coming up next: The next profile will be Brian Boehringer. I have two cards of Brian Bocock. This one is from 2008 SP Authentic Rookie Exclusives. Playing career: Shortstop Brian Bocock was the Giants’ ninth round draft pick in 2006, and two years later he was in the major leagues, hitting .143 in 32 games with San Francisco. He reemerged in the majors with the Phillies for six games in 2010, and has since then played in the Pirates, Blue Jays, Nationals and now Royals organizations. Blog synchronicity: This is the 2012th post on this blog. In 2012 Bocock played in 93 games in the Blue Jays organization, splitting between AA New Hampshire and AAA Las Vegas, hitting .237 with 2 HR, 34 RBI and 18 SB. Where he is now: He is now in the Royals organization. In 79 games, splitting between AA Northwest Arkansas and AAA Omaha, he is hitting .269 with 1 HR, 16 RBI and 4 SB. Google Autocomplete results: He is first when you type Brian Boc, ahead of Brian Bockrath, Director of Scripted Programming at AMC. There do not appear to be any other prominent Brian Bococks. Coming up next: The next profile will be Mike Boddicker. I have one card of Jose Arredondo, from 2010 Upper Deck. Playing career: Jose Arredondo pitched for the Angels and Reds from 2008 to 2012, putting up very good numbers in his 214 games – 22-11 record, 3.27 ERA. However, he pitched poorly in the minors in 2013 and also was suspended for disciplinary reasons, and appears to have quickly worked his way out of baseball. Blog synchronicity: This is the 2011th post on this blog. In 2011 Arredondo pitched in 53 games for the Reds, all in relief, going 4-4 with a 3.23 ERA. Where he is now: He does not appear to be pitching this year. Anyone know where Jose Arredondo is now? Google Autocomplete results: He is fourth when you type Jose Ar, between Jose Arcadio Buendia, a character in a Gabriel Garcia Marquez novel, and Jose Ardon, an Organo Gold salesman. Another prominent Jose Arredondo is an investment banker at Blackstone. Coming up next: The next profile will be Brian Bocock. Got a bunch of awesome cards in a trade with Scott Crawford. I'm really enjoying the new Donruss set. Got a bunch of 2009 Topps in this trade. It's interesting to look at the photography here, and see how much more interesting it was a few years ago when Topps still had to compete with Upper Deck. Shortstop Tim Harkrider played in the Angels organization from 1993 to 1997. In 362 games he hit .280 with 4 HR, 127 RBI and 24 SB. Now the Superintendent for the Willis Independent School District in Texas, he kindly answered my questions about baseball cards. "I found my first card in a pack at Wal-Mart. You could see through the packaging on the back, and the first pack I picked up I saw my card. My first card was my favorite - Bowman set 1993. I do not collect baseball cards." Outfielder Jeff Barton played in the Padres organization in 1989 and 1990. In 152 games he hit .251 with 6 HR and 86 RBI. Now Vice President & Regional General Manager at MobilexUSA, a mobile laboratory service, he kindly answered my questions about baseball cards. "Ever since I can remember, my Dad and I have collected baseball cards. Growing up in the cold winters of Boston, we would look forward to finding the first pack of Topps that would come out that year, as it meant baseball season was getting closer. To this day, we still miss the hard gum stick that used to be included. Even now, some 40 years later, my Dad and I will still find packs of baseball cards and won’t open them until we’re together. When I was probably seven or eight years old, I still remember trading a card that had Hank Aaron, Babe Ruth and Willie Mays on it for 25 “random cards”. It was my first negotiation and my first lesson that quantity is not necessarily better than quality. I grew up opening packs of cards hoping for a Rico Petrocelli, George Scott, Fred Lynn or Jim Rice. The first ball I was ever given at Fenway Park was by Al Zarilla…my Dad found his baseball card and I still have it. I remember when Donruss first came out with their baseball cards and you would open a pack and there were always doubles of the some of the cards. When I was drafted by the San Diego Padres, our first baseball cards were taken in front of stores in the local Spokane, WA mall. Later our team held a card signing in the mall and the signing went on for two hours…I’m still amazed that I had a baseball card and even more surprised that someone actually wanted my autograph. My manager that year was Bruce Bochy and I knew how he felt about being confused with Bruce Bochte. I told that story to my Dad while I was playing and he went into our attic back home in Boston and found a Bruce Bochte card and mailed it to me in Spokane. As a joke, I walked into Boch’s office one day and asked if he would autograph one of his cards and he said sure. I gave him the Bochte card and within seconds the card was ripped up and put in the trash. By the way, there is no better leader of men than Bruce Bochy. He is one of the best managers in the game and an even better person. To this day, he taught me lessons that carried well beyond the playing field. As a young boy, collecting baseball cards with my Dad was something I looked forward to every weekend. He would go out early Saturday and Sunday morning to get the paper and would always bring home packs of cards. We still have all of them in the house where I grew up. While we don’t really collect them anymore, if we ever see a pack of cards, we’ll usually buy 2 packs and then open them when we’re together. I actually have two unopened packs in a drawer waiting for his next visit. Baseball cards are a right of passage, though they were more fun when there was a stick of gum inside." I have five cards of Randy Bockus. This one is from 1989 Bowman. Playing career: Randy Bockus pitched for the Giants and Tigers from 1986 to 1989. In 39 games he went 2-1 with a 4.23 ERA. Where he is now: Anyone know where Randy Bockus is now? Google Autocomplete results: He is sixth when you type Randy Boc, between Randy Boczkowski, an event manager, and Randy Bochino, a personal trainer. There do not appear to be any other prominent Randy Bockuses. First off, check out my second baseball card retrospective of this year's Hall of Very Good inductees. Today's inductee is Tony Oliva. I have fifteen cards of Bruce Bochy. This one is from 1987 Fleer. Playing career: Bruce Bochy played nine seasons as a backup catcher for the Astros, Mets and Padres. In 358 games he hit .239 with 26 HR and 93 RBI. A fuller account of his career can be found at the 1980 Topps Blog. Interesting facts: On the 1980 Topps blog I learned that Bochy’s right eyelashes were dyed permanently blonde in an accident at the furniture refining shop he worked at as a teenager. You can see the eyelashes on that and several other of Bochy’s cards. In 2011 Bochy ended a 40-year habit of using chewing tobacco through the use of a hypnotist. Where he is now: Bochy has been a major league manager for the past twenty years. After twelve years and one pennant with the Padres, he moved to San Francisco in 2007, and has already won two world championships with the Giants, in 2010 and 2012. Will 2014 make it three even years in a row? Right now the Giants are 56-44 after last night's 9-6 win in Philadelphia. They are one game up on the Dodgers and have the best record in the National League. Blog synchronicity: This is the 2006th post on this blog. In 2006 Bochy led the Padres to the NL West title and was NL Manager of the Year, yet after the season the Padres let him interview with the Giants and he took that job, and has not looked back. My memories: I remember him managing the Padres against the Yankees in the 1998 World Series. I remember he made some tactical error in the first game and he was getting grilled about it by the media afterwards, and thinking that he already looked so defeated. I am glad he ended up having greater success later on in San Francisco. His overall won-loss record is still a little light but he is on the trajectory for a potential Hall-of-Fame-worthy career as a manager. Google Autocomplete results: He is fourth when you type Bruce Bo, between Bruce Bozzi, owner of the Palm Steakhouse in New York, and Bruce Boudreau, Head coach of the Anaheim Ducks. Coming up next: The next profile will be Randy Bockus. First off, a note that the Hall of Very Good is announcing it's 2014 enshrinees. The first is Luis Tiant. Head on over to see my baseball card retrospective on Tiant, and Josh Wilker of Cardboard Gods has a great piece on Tiant as well. 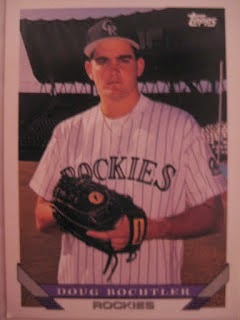 I have one card of Doug Bochtler, from 1993 Topps. Playing career: Doug Bochtler pitched for the Padres, Tigers, Dodgers and Royals from 1995 to 2000. In 220 games he went 9-18 with 6 saves and a 4.57 ERA. A fuller account of his career can be found at The Greatest 21 Days. Where he is now: A pitching coach for the South Bend Silver Hawks, Single-A affiliate of the Diamondbacks, and owner of the Cherokee Baseball instructional facility in Knoxville, TN. Interesting facts: He was a bit of a jokester in his playing days. Here is video of him stealing the drink of a fan sitting next to the Padres dugout. Google Autocomplete results: He is second when you type Doug Boc, between Doug Bocchino, an Associate at Casimir Capital, and Doug Boccia, VP, Network Strategy at Advertising.com. There do not appear to be any other prominent Doug Bochtlers. Coming up next: The next profile will be Bruce Bochy. I have 21 cards of Bruce Bochte. This one is from 1985 Topps. Playing career: First baseman Bruce Bochte was a high-average, low-power first baseman for the Angels and Mariners in the late 1970s and early 1980s. His best season was 1979, when he was an AL All-Star for Seattle, hitting .316 with 16 HR and 100 RBI. He quit baseball after the 1982 season in disgust with what he saw as the increasing influence of money in the game of baseball. He did return in 1984 to spend three seasons with the Oakland A’s. You can learn more about his playing career at the 1975, 1976, 1980, 1983 and 1986 Topps blogs. One thing I learned from the 1975 Topps blog that I hadn’t noticed before is that he signs his name all in lowercase. You can see this on the facsimile signature on his 1980 and 1982 cards as well. Where he is now: During and after his playing career Bochte has been a staunch environmental advocate. Since 1990 he has been Executive Director of the Center for the Story of the Universe, which was founded by Bochte’s college classmate, world-famous cosmologist Brian Swimme. Bochte and Swimme’s cosmology is based on the belief that plants, stars and humans all consist of the same elements and are all deeply connected. In a 2001 interview, Bochte explained, "In traditional religion, the understanding is that God put the human on Earth and that the human is here to glorify God. I don't think that way anymore. We know that the human came out of the Earth and the universe. We're the descendants of a long, long journey of life on the planet. We came into the planet out of the planet itself. I don't think we were imported here. How do we fit in in a way that does not lead to destruction of ourselves? If you see yourself as coming out of the natural world, your perspective changes. I want to enhance the world while I'm here. We need to put ourselves in a position to have a chance to flourish in the future. The human species needs to come up with a 5,000- or 500,000- or 5 million-year survival plan on Earth." Bochte worked with the Adopt-A-Stream organization in Whidbey Island, WA to restore a coho run. "I consider that my crowning achievement, the fish coming back," Bochte said. Google Autocomplete results: He is second when you type Bruce Boc, between Bruce Bochy, manager of the Giants, and Bruce Bocina, owner of Bocina Homes. There do not appear to be any other prominent Bruce Bochtes. Coming up next: The next profile will be Doug Bochtler. I have four cards of Hiram Bocachica. This one is from 1996 Best. Playing career: Outfielder Hiram Bocachica played eight years in the major leagues for the Dodgers, Tigers, Mariners, A’s and Padres. In 272 games he hit .215 with 15 HR and 37 RBI. He also spent time in Japan. Blog synchronicity: This is the 2003rd post on this blog. In 2003 Bocachica spent most of the season in the minors but did appear in six games for the Detroit Tigers in April, getting one hit in 22 at-bats. Where he is now: A player agent at The Legacy Agency. Google Autocomplete results: He is first when you type Hiram Bo, ahead of Hiram Bonner, former executive administrator for NYC Mayor Dinkins. There do not appear to be any other prominent Hiram Bocachicas. Coming up next: The next profile will be Bruce Bochte. Got a ton of cool cards in contest winnings from Red Cardboard. I picked the "overage" mostly because of two cards that were included. This is one of them. I've seen the new Donrusses on other blogs, but this is my first one. I really like a retro look for a set that is not Topps. I especially like the rainbow D logo. The other was this card - I have most of the Topps All-Star cards from this era, but didn't have any of the '91's, with the Topps 40 anniversary logo. He included a few dozen extra cards, which was a nice surprise. Here is another cool retro-style card from a non-Topps set. This may be the most interesting card in the set - my first 1/1, hand-signed by the Diamond King himself, Adam Dunn. I have one card of Elgin Bobo, from 1992 Classic Best. Playing career: Catcher Elgin Bobo played in the Angels organization from 1990 to 1992. In 161 games he hit .276 with 4 HR and 71 RBI. Where he is now: Works for Couch Distributing, a beer distributor in California. My memories: Only know him from his card. Great name, though. Google Autocomplete results: He is first when you type Elgin Bob, ahead of Bob Elgin, a musician. There do not appear to be any other prominent Elgin Bobos. Coming up next: The next profile will be Hiram Bocachica. I have one card of Jay Bobel, from 1987 ProCards. Playing career: Jay Bobel was drafted by the Angels in 1987 and pitched for their Salem team that year, going 2-4 with a 6.07 ERA in thirteen games. The following season he pitched for Reno in the independent California league, going 1-4 with a 7.17 ERA in fourteen games. Eighteen years later, he attempted a comeback as a knuckleballer for Calgary of the Northern league. In six games he went 0-2 with a 9.97 ERA. Where he is now: A self-described “serial entrepreneur” who currently owns the financial services firm Spartan Equities and the baseball camp Michigan College Connect. He is also a scout for the Rockies. Google Autocomplete results: He is ninth when you type Jay Bob, between Jay Bob Strike Back, referring to a movie, and Jay Bobbin Tribune, a writer. There do not appear to be any other prominent Jay Bobels. Coming up next: The next profile will be Elgin Bobo. I have 72 cards of Bert Blyleven. This one is from 1985 Topps. Playing career: Bert Blyleven pitched 22 years in the major leagues, winning 287 games and striking out 3,701 batters. He was an ace pitcher for some mediocre Twins and Rangers teams in the early and mid-1970s, putting up stellar numbers everywhere but the W-L record due to poor run support. In 1977, following a tumultuous September with the Rangers in which he both threw a no-hitter and flipped the bird at the camera in another, nationally-televised game, Blyleven was traded to the Pirates, where he helped the team win the world series in 1979. The next season, however, Blyleven quit on the team, leaving the club for two weeks in the middle of the season and demanding a trade. After the season he was dealt to Cleveland where he returned to putting up excellent numbers for bad clubs. In 1985 he was dealt to the Twins in August for young shortstop prospect Jay Bell. That season, pitching for two teams that would finish a combined 50 games below .500, Blyleven lead the AL in strikeouts, complete games and shutouts. He helped the Twins win the World Series in 1987, and as late as 1989, at the age of 38, Blyleven finished third in the Cy Young voting after a great season with the Angels. My memories: I started following baseball in 1986, and that was the year Blyleven gave up a then-record 50 home runs, so I had in my mind an image of him as being not very good. However, a look at his full career indicates that he was one of the best pitchers of his era, albeit cursed to play with mostly bad and small-market teams which hurt his national visibility. Although I didn’t have a strong opinion about his Hall-of-Fame candidacy, I had no problem with his being voted into the Hall in 2011. Where he is now: An announcer for the Twins. Interesting facts: Blyleven was known as a prankster during his career. He gave so many “hot-foot’s” to his teammates that he was known as the “Frying Dutchman.” The “Dutchmen” part of the nickname refers to the fact that Blyleven was born in the Netherlands. His family moved to Canada when he was two and then to California, where they stayed, when he was five. He grew up thinking his name was Rikaalbert Blyleven. It was only when he was getting married that he found out his real name was Rik Aalbert Blijleven. In 1982, while rehabbing from an arm injury, Blyleven coached a little league team. In order to make the kids look more like real big leaguers, Blyleven gave the children chewing tobacco. Google Autocomplete results: He is second when you type Bert B, between Bert Berns, a record producer, and Bert Brodsky, a businessman swindled by Bernard Madoff. Coming up next: The next profile will be Jay Bobel. I have five cards of Jaime Bluma. This one is from 1995 Bowman. Playing career: Jaime Bluma pitched in the Royals organization from 1994 to 2000, going 19-18 with a 3.94 ERA and 76 saves. In 1996 he appeared in seventeen games in the major leagues, going 0-0 with a 3.60 ERA and five saves. Blog synchronicity: This is the blog's 1998th post. In 1998 Bluma split the season between AA Wichita and AAA Omaha, going 1-3 with 2 saves and a 5.54 ERA in 53 games. Where he is now: He teaches the baseball camps at 68 InsideSports in Overland Park, KS. Interesting facts: In 2013 Bluma assisted a family, including two babies, whose car flipped over in an accident in front of where he was driving. Bluma immediately pulled over and helped pull the family out of the car. In the rescue Bluma ruptured his patella tendon, which ended up being the worst injury suffered in the accident. Google autocomplete results: He is seventh when you type Jaime Bl, between Jamie Blais, Associate Director, Global Medical Affairs at Otsuka Pharmaceuticals, and Jaime Blanch, an actor. There do not appear to be any other prominent Jaime Blumas. Coming up next: The next profile will be Bert Blyleven. I have thirteen cards of Geoff Blum. This one is from 2000 Metal. Playing career: Utility infielder Geoff Blum played fourteen seasons in the major leagues for six different teams, mostly the Expos and Astros, and hit .250 with 99 HR and 479 RBI. Though he played in just 31 regular seasons for the White Sox, the fewest of any of his six teams, that is the team he is best remembered for, after his fourteenth-inning home run won Game 3 of the 2005 World Series, the longest World Series ever played. Blog synchronicity: This is the 1997th post on this blog. In 1997 Blum played in 118 games at AAA Ottawa, hitting .248 with 3 HR, 35 RBI and 14 SB. Where he is now: An announcer for the Astros. My memories: I remember going to a Yankees-Expos game and getting the brilliant idea to shout “Blum, you’re a bum!” every time he came up. I still think of that every time I come across that name. Google Autocomplete results: He is tenth when you type Geoff B, behind Geoff Beattie, former president of the Woodbridge Company. There do not appear to be any other prominent Geoff Blums. Coming up next: The next profile will be Jaime Bluma. I have one card of Brent Blum, from 1987 ProCards. Playing career: Brent Blum pitched in the Yankees organization from 1985 to 1988. He tore up rookie ball in 1985, going 6-0 with a 1.38 ERA in eight starts. A and AA ball were less kind to him however, as he went 16-10 with a 4.43 ERA over four seasons. Where he is now: Anyone know where Brent Blum is now? Google Autocomplete results: He is eighth when you type Brent Bl, between Brent Blaylock Browns, referring to an NFL scout, and Brent Blake, a former strategy director at Burger King. There are no references to the ballplayer on the first page of Google results; the first entry is for a Cyclone Fanatic columnist. Coming up next: The next profile will be Geoff Blum. Of the thirteen cards, eleven featured semi-closeup photos of players (both position and pitcher) throwing the ball. It's lack of variety like that which makes a set both all-action and kind of dull at the same time. There were also a bunch of UD cards in the trade. These cards show a lot more variety, and full body action shots appear more dynamic. I have three cards of Jim Blueberg. This one is from 1987 ProCards. Playing career: Jim Blueberg pitched for six seasons in the Mariners and Yankees organizations, going 46-48 with a 3.77 ERA. His best season was 1989, when he went 11-6 with a 2.12 ERA for San Bernardino. A fuller account of his career can be found at The Greatest 21 Days. Where he is now: A scout for the Mets. Interesting facts: His son Cody was drafted and signed by the Padres in 2014. Google Autocomplete results: He is fourth when you type Jim Blue, between Jim Blue Pillar to Post, a home inspector in Alabama, and Jim Blue Photography, an African safari nature photographer. There do not appear to be any other prominent Jim Bluebergs. Coming up next: The next profile will be Brent Blum. I have 21 cards of Vida Blue. This one is from 1978 Topps. I love the incongruity of the word "Blue" written in black on a white shirt under a green and yellow shirt. Playing career: Vida Blue’s 1971 season was one of the greatest breakout-seasons ever. Though not a complete unknown (he threw a no-hitter in a September call-up the previous year), the 21-year-old set the baseball world on fire, going 24-8 with 301 strikeouts and a 1.82 ERA, winning both the Cy Young and MVP awards. The next season was truncated by a hold-out (unheard of today but fairly common in pre-free-agency days), and when he returned he was still a very solid pitcher, though unable to completely capture the electric stuff of his magical 1971. In fact, he never even struck out even 200 batters again, let alone 300. Still, he was one of the most consistent pitchers of the 1970s, making at least 34 starts a year with the A’s, and later the Giants, and only twice recording ERAs over 3.25. A trade to the Kansas City Royals, one of the most drug-addled teams in baseball, before the 1982 season put Blue firmly on a downward spiral, however. After the 1983 season he was one of four Royals to plead guilty to attempt to purchase cocaine. His career ended after a comeback with the Giants in 1985 and 1986. Interesting facts: Blue has continued to battle addiction after his baseball career. He was a menace to northern California drivers in the late 1990s and early 2000s, being arrested three times for drunk driving. Blue dabbled in the entertainment industry to capitalize on his newfound celebrity after the 1971 season. He joined Bob Hope on a USO tour of Vietnam and had a small role in the Jim Brown/Martin Landau film Black Gunn. Where he is now: A baseball analyst and community representative for the Giants. My memories: He is from before my time, though I had often heard about him. Google Autocomplete results: He is third when you type Vida , between Vida Ricky Martin, referring to a song, and Vida Yoga, referring to a yoga location in Greenwich Village. There are no other prominent individuals named Vida Blue, but an electronic-music band that took their name from the ballplayer gained some prominence in the early 2000s. Vida Blue the pitcher joined Vida Blue the band on stage in a 2004 concert in San Francisco. Coming up next: The next profile will be Jim Blueberg. I have 39 cards of Mike Blowers. This one is from 1990 Classic Traded. Playing career: Third baseman Mike Blowers came up with the Yankees in 1989 and played very poorly for them, hitting .203 with 6 HR and 25 RBI in 76 games over three seasons. Traded to the Mariners after the 1991 season, he went on to have some decent seasons with them, including a career year in 1995, hitting .257 with 23 HR and 96 RBI. He ended his career with forgettable stops with the Dodgers, A’s, and two more go-rounds with the Mariners. Blog synchronicity: This is the 1992nd post on this blog. In 1992 Blowers played in 31 games for the Mariners, hitting .192 with 1 HR and 2 RBI. Interesting facts: He was arrested for DUI in 2011 after being pulled over for weaving among three lanes in the early morning hours. Where he is now: A broadcaster for the Mariners, he has also been involved in real estate investing and home building, for which he has received a lot of complaints for shady dealings. My memories: I remember him being really bad with the Yankees, and was surprised to see him put together some respectable seasons in Seattle. Still, he was not a guy that you ever feared as an opposing fan. Google Autocomplete results: He is eighth when you type Mike Bl, between Mike Bloom, President of Family Dollar Stores, and Mike Bledsoe, Owner of Faction Strength & Conditioning in Memphis. Another prominent Mike Blowers is a stock car racer. Coming up next: The next profile will be Vida Blue. I have seventeen cards of Greg Blosser. This one is from 1994 Collectors Choice. Playing career: Greg Blosser played twelve seasons of professional baseball, hitting .252 with 155 HR and 522 RBI in 1,021 games. He played in 22 games for the Red Sox in 1993 and 1994, getting three hits in 39 at-bats. Blog synchronicity: This is the 1991st post on this blog. In 1991 Blosser played in 134 games at AA New Britain, hitting .217 with 8 HR and 46 RBI. Where he is now: In 2005 he was arrested after pulling a semi-automatic gun during a fight in Bradenton, FL. At the time his occupation was “private investigator”. He is now a realtor in Bradenton. Google Autocomplete results: He is eighth when you type Greg Blo, between Greg Blood Sweat and Heels, referring to a reality show character, and Greg Blount, a producer. Another prominent Greg Blosser is a minister in Ohio. Coming up next: The next profile will be Mike Blowers. I have three cards of Willie Bloomquist. This one is from 2010 Upper Deck. Playing career: Utilityman Willie Bloomquist has spent thirteen years in the major leagues. He came up with the Mariners in 2002, and played with them through 2008, before moving on to Kansas City, Cincinnati and Arizona. Though he is not much of a hitter (80 career OPS+) he has good speed, stealing 131 bases in 1010 games. Where he is now: Back with Seattle in 2014. In 37 games he is hitting .270 with 1 HR and 12 RBI. He last played on Saturday, going 0-3 in Seattle's 3-2 win over the White Sox. My memories: Like Jeff Blauser, I always assumed he was a defense-first guy. Actually, he provides more “value” on offense, with a 5.4 career oWAR and -2.6 dWAR. He is often considered a prototype of a “replacement-level” ballplayer. Google Autocomplete results: He is sixth when you type Willie B, between Willie Brown Musician, referring to a blues guitarist, and Willie Beamen, a character in the movie Any Given Sunday. There do not appear to be any other prominent Willie Bloomquists. Coming up next: The next profile will be Greg Blosser. I have one card of Darin Blood, from 1997 Topps. Topps spelled his name wrong on the card. Playing career: Darin Blood pitched in the Giants and Orioles organizations from 1995 to 2000. His best season was 1996, when he went 17-6 with a 2.65 ERA for Class-A San Jose. Overall in 112 games he went 38-32 with a 4.03 ERA. Where he is now: Working as an instructor at Premier Sports Center and an Executive Pastor at Real Life Ministries, both in Post Falls, ID. Google Autocomplete results: He is first when you type Darin Bl, ahead of Darin Blackwell, Production Manager at North American Roofing. Another prominent Darin Blood owns Sharp Edge Tree and Landscape in Georgia. Coming up next: The next profile will be Willie Bloomquist. My first 2014 Yankees! Cool photo of Brett Gardner. I've been enjoying having Alfonso Soriano back on the Yankees, even though he is struggling this year. This 2014 card is already out of date. He's "John Ryan" now, not "J.R."
My first ever Bryce Harper card! The red border on this card really looks great. Great photo too. Got a ton of great cards in another awesome trade with Nick from Dime Boxes. When I saw this card on top I knew it would be a great package. I love cards with goofy photos like this. It's funny the lengths the unlicensed brands have to go to in order to avoid logos. That's how we get amusingly-bad photo composition like on this card. I love these sparkly diamond parallel cards. My first 2014's! Honestly I'm not impressed by the design - looks almost the same as 2013 except for a bump over the name instead of last year's "sea turtle". Scott Lewis pitched five seasons for the California Angels. His best season was 1992, when he went 4-0 with a 3.99 ERA. Now the owner of S.A. Lewis Construction in Newport Beach, CA and Principal at RayGen, a clean energy company, he kindly answered my questions about baseball cards. "The only stories I have about cards would be a card in which I was wearing a glove that I was not supposed to be wearing. I was under contract with Rawlings and wore an SSK glove on a nationally televised game that subsequently resulted in a baseball card being shot the same night. Needless to say Rawlings was not happy about it. Favorite card would be Upper Deck because it was my first official card made. They were a local company out of Yorba Linda and I toured the factory which was kind of special. Lastly, my Dad and I collected a few cards while I was playing and my son has some special cards that I still do not know the real value of but they are very unique proofs." Outfielder Jeff Salazar played four seasons in the major leagues for the Rockies, Diamondbacks and Pirates. In 168 games he hit .232 with 4 HR and 31 RBI. Now the owner of FlowWraps, which makes arm wrappings for pitchers that are designed to help reduce injuries, he kindly answered my questions about baseball cards. "I don't collect cards anymore, but I still have my collection from when * was a kid. They are still very precious to me. Ozzie Smith and Barry Bonds were my 2 favorite to collect. I have over 100 different Bonds cards. I remember saving up enough money, riding my bike to the baseball card store and buying Bonds' rookie card for $35. One story about my own cards...there's one of me in a Dbacks uniform, but I took the pic in a Rockies uniform. They made an error on the pic because they didn't edit my entire pants legs. You can see Rockies pinstripes from the calf down." I have one card of Ben Blomdahl, from 1992 Classic Best. Playing career: Ben Blomdahl pitched eight seasons in the Tigers and Indians organizations. He appeared in fourteen games for the Tigers in 1995, going 0-0 with a 7.77 ERA. Where he is now: He works for Pulte Group/Del Webb, and in 2013 was named Sales Manager of the Year by the Building Industry Association of Southern California. Google Autocomplete results: He is first when you type Ben Blom, ahead of Ben Blomberg Columbia, referring to a Senior Equity Analyst at Columbia Management. There do not appear to be any other prominent Ben Blomdahls. Coming up next: The next profile will be Darin Blood.